Another day of play wrapped up for the 2012-13 World Series of Poker Circuit Caesars Palace Las Vegas Main Event on Sunday, as Day 2 moved into the books. The field finished with 15 players left and Jeff Fielder on top with his stack of 2.239 million in chips. Only 14 players stand between Fielder and a second title in less than a month. Back on January 21, Fielder won the WSOP Circuit Choctaw Main Event for for $312,080. Fielder is also on familiar territory in Las Vegas. Last season on the WSOP Circuit, he finished fifth place in this very event and took home $50,231. 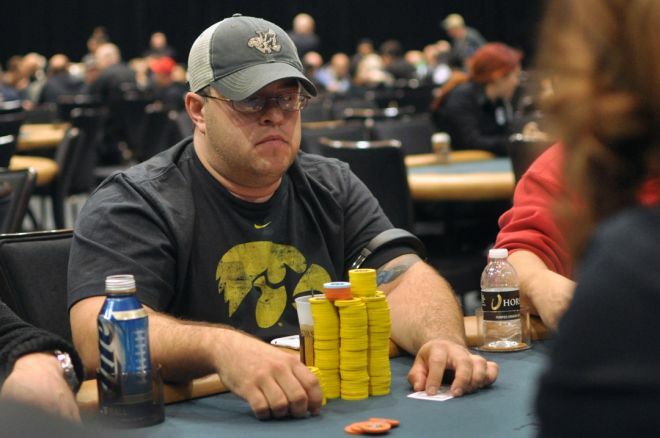 When it comes to WSOP Circuit accolades, Fielder has 18 cashes and winnings of $448,045. It looked as though Fielder was going to be the overnight chip leader heading into Day 3, but just for good measure, he topped things off by eliminating Gavin Smith on the final hand of the day. According to the WSOP live reporting staff, here's how things went down. During Level 24 with the blinds at 8,000/16,000/2,000, Janelle Jacobson opened with a raise to 40,000 from middle position, then Smith reraised all in for 110,000 behind her. Action moved to Fielder in the small blind, and he made the call. Jacobson folded, leaving Fielder to do the dirty work against the at-risk Smith. Smith tabled the , holding the better of it against Fielder's . On the flop, though, Smith fell behind as the hit the felt. The on the turn left Smith needing an ace on the river, but the couldn't deliver and he was eliminated in 16th place for $11,350. One thing that took center stage on Day 2 was the money bubble. During Level 19 with the blinds at 2,500/5,000/500, Cristine Arpon had an opponent all in and at risk for approximately 40,000 with her versus the . The board ran through to give Arpon a club flush and eliminate the other player in 82nd place. Many notables were in action in Day 2, including David "Doc" Sands and his fiancé Erika Moutinho, and they just happened to begin the day side by side. In fact, it was Sands who busted his future wife not too long into the day. Sands was then eliminated by start-of-the-day chip leader Ryan Welch later on during Level 23. With the blinds at 7,000/14,000/2,000, Sands raised from late position, and Welch reraised all in for 344,000 out of the big blind. Sands called to put himself at risk with the and was fighting against Welch's . After a run out of , Sands was sent to the rail, finishing in 22nd place for $7,968. Other players eliminated in the money on Day 2 were Tim Duckworth (25th - $6,796), Adam Junglen (28th - $5,859), Steve Gross (34th - $4,509), Hans Winzeler (43rd - $4,018), Erick Lindgren (49th - $3,616), Keven Stammen (55th - $3,292), Eric Baldwin (61st - $3,292), Scott Clements (62nd - $3,292) and Dan O'Brien (70th - $3,024). The players are scheduled to return to action for Day 3 starting at 1 p.m. PT. Six players will need to go home before the final table is reached, but once that happens, ESPN3 will be airing the final table with hole cards on a 30-minute delay. Stay tuned to PokerNews for the recap to follow play.